As the U.N. Security Council considers a request for additional peacekeepers in eastern Democratic Republic of Congo, Angola said it would send troops to the country. As Derek Kilner reports from VOA's East Africa bureau in Nairobi, Angola has not said how many troops will be sent, though there have been reports that Angolan soldiers are already in eastern Congo. Angola Foreign Minister Georges Chicoty announced on Angolan national radio that his country would send troops to eastern Congo, where government soldiers and a rebel group led by Laurent Nkunda remain in a standoff outside the town of Goma, near the Rwandan border. Several witnesses in eastern Congo have described seeing Portuguese-speaking soldiers alongside Congolese troops, although the United Nations has said it has no evidence of their presence. On Sunday, the Southern African Development Community, of which Angola is a member, said it would consider sending peacekeepers if the conflict deteriorates. Meanwhile, the U.N. Security Council is considering a request by Secretary General Ban Ki-moon to add 3,000 soldiers to the U.N. peacekeeping force. The mission, known by the French acronym, MONUC, has 17,000 troops, most of them in the country's east. But only about 5,500 of them are in North Kivu province. U.N. peacekeeping head Alain Le Roy briefed members of the Security Council on Tuesday, after returning from Congo. "We still consider that although we have almost 10,000 troops in the Kivus it is still insufficient," Le Roy said. "The population of the Kivus is 10 million inhabitants. So it means we have in fact 10 peacekeepers for 10,000 civilians to protect in the Kivus. So we consider that extra forces would be very much needed." He said Security Council members have appeared favorable to the request for additional troops, but even if they are approved, their deployment would take at least two months. MONUC spokesman Madnoje Mounoubai says approval is also likely to take some time. "The Security Council is not going to make a final decision until the end of this month," Mounoubai said. "We have been working with this same force for the past year, we are trying to do the best we can with what we have until we hear from our boss." Rebels and government soldiers remain deployed within a few hundred meters of one another, 15 kilometers north of Goma. A brief firefight was reported near the line late Tuesday, the latest in a series of small clashes that have continued despite the presence of a tentative cease-fire. Nkunda says his forces are protecting the ethnic Tutsi community in North Kivu from a Rwandan Hutu militia, many of whose members participated in that country's 1994 genocide, and who Nkunda says are cooperating with the Congolese military. 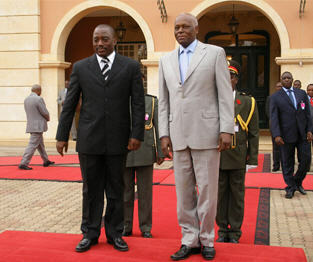 Congo says Nkunda's forces are receiving backing from Rwanda, a charge both Nkunda and Rwanda have denied. The involvement of Rwanda and Angola have raised concerns the current fighting could escalate into a regional conflict similar to Congo's 1998 to 2003 civil war.